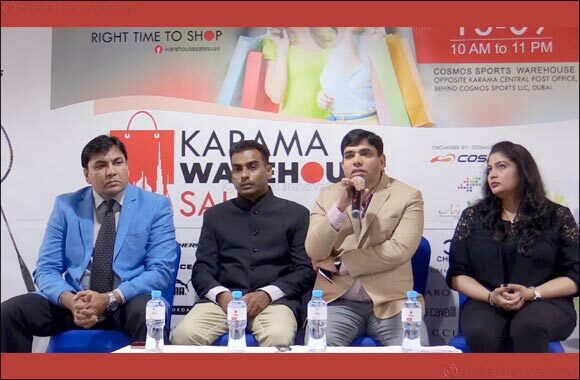 September 11, 2018 - Dubai, UAE: It's time to bring global brands to consumers at a reasonable price, Organizers informed in a news conference in Dubai that they will be organizing 'Karama Warehouse Sale' in Karama. The fair starting on this coming Thursday (13.9.2017) will last till 9th October . Cosmos sports, one of the prominent multi-brand sports and fitness showrooms in India and prominent advertising company Eden are organizing Karama Warehouse Sale. The sale will be held on the back of the Cosmos Sports Showroom opposite to the general post office in Dubai Karama. The marketing fair is open from 10 am to 11 pm. The official inauguration of Karama Warehouse Sale will be held on Thursday at 11:30 am by Director General of Dubai Emigration Major General Mohamed Ahmad Al Marri and Malabar Gold and diamonds International operations MD Mr. Shamlal Ahmed. The organizers informed the press conference that over 100 branded global brand products would be available at the most affordable prices. Apart from the international sports brands, Karama Warehouse is available in a variety of high quality brands including watches, spray and various home accessories at a low cost price. The international brands will be more familiar to the customers than at the higher prices. Cosmos sports in advance to make the people better acquainted with the best fitness equipment by expressing solidarity to the goal of the Dubai Fitness Challenge in the second phase of Dubai Crown Prince Sheikh Hamdan bin Mohammed bin Rashid Al Maktoum aimed at exercising among the people and improving health care. Cosmos Sports Co-chairman AK Faisal said: 'This is a vast array of sports that has special interest in sports. Along with that, other international brands are also coming up to promote a great shopping experience, 'he added. The Cosmos Sports has already gained access to the Indian Government's approvals as it is marketed as one of the most well-to-do marketing firms for the purpose of providing health care. It is well known among the sports enthusiasts of Kerala as well. 'Cosmos Sports, which focuses on sports development, plans to open new showrooms in the UAE.